This is the old manor house which Jo's daughter and family were thinking of buying, but the estate agent hadn't updated the pictures. There was a day last year, October the 15th, when the sky over southern Britain turned an apocalyptic orange – we knew that the remnants of a hurricane, Ophelia, was about to hit us, but it was not until later on that we learnt that the extraordinary light conditions were the result of soot from fires in Spain and Portugal. Forest fires on a massive, and so far unprecedented scale for Europe. Having just spent a couple of weeks in the affected area, and concerned that there has been very little publicity about what happened outside the region, I want to say something about the issue here. 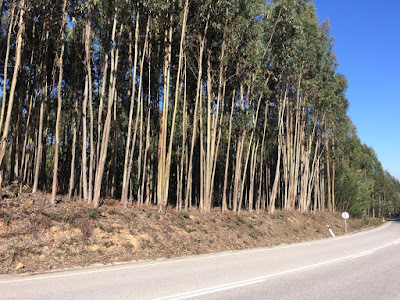 There had already been severe fires in Portugal in June, and a blog posting of mine then had discussed them in terms of them being largely the result of extensive eucalyptus planting. The conditions in October were exceptional: Ophelia was the most easterly tracking hurricane ever, big storms rarely go that far south, and the region was tinder-dry after many months without rain. All of these are indicators of a possible outcome of climate change. Words cannot even begin to describe the scale of devastation, which has had nothing like the international press coverage it deserves. It looks as if someone has taken a flame-gun to the countryside. 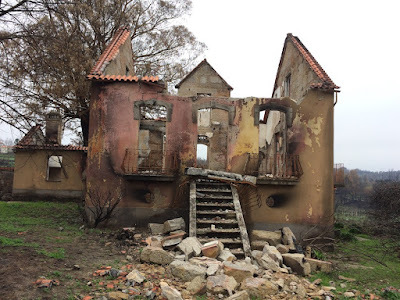 It is possible to drive for several hours across central Portugal and nearly every area of forest or trees in villages or in farmland have been burnt. Many houses too, especially the rather splendid big old abandoned houses which this country of large-scale rural depopulation is littered with. Some factories and warehouses too. Parts of the country are like a war zone. The Avo valley, a steep river valley, once very picturesque despite the ever-present eucalyptus is now a blackened ruin of a landscape. All in all, a terrifying presage of what might become much more common with climate change. Eucalyptus acted as a vector for the fires spreading them into areas of pine (also relatively inflammable) and other areas of woodland. There is very little deciduous woodland left in central or northern Portugal, and oddly a lot of oaks loo relatively damaged. Deciduous trees like oaks and chestnuts are not so inflammable. Indeed where there is deciduous woodland, it seems as if the fire has not penetrated. Fire is an important part of ecologies in many regions and the idea that it is always bad and damaging is now rejected. Understanding it is vitally important as to how we manage landscapes and indeed plant gardens. There are many 'fire-resistant' trees. Eucalyptus however the opposite, as they appear to deliberately court fire. This is what makes them so dangerous. I'll try to explain. Think of Pinus pinea, the umbrella-shaped Stone Pine of the Mediterranean – its shape is obviously designed to keep the foliage canopy up and away from ground fires. Cork oaks are similar, and of course have the amazing fire-resistant bark which has long been one of Portugal's main exports. Pinus palustris, the Longleaf Pine of the American South does not have this shape but gets its foliage up from the ground very quickly. This latter and its relationship with fire is now recognised as having been fundamental to a vast swathe of land from North Carolina around to the border with Texas (most was felled in the late 19th century to make way for slave-grown cotton). Longleaf dominated its territory, but by leaving a big gap between the ground and the canopy allowed ground fires to sweep across vast areas doing little damage to the trees. The regularity of the fires ensured that there was no build up of fuel – many of these fires were probably like prairie fires, very superficial. They would however have damaged many tree seedlings but left the better-adapted Longleaf seedlings. However it enabled a very diverse grass and wildflower flora to flourish. and indeed anything else about this remarkable tree that you can find. Key to the survival of all these species is to have small and frequent ground fires. This makes canopy fires rare, and it these that do the really lethal damage to mature trees. Pines do not survive, and generally only do so through their seedlings taking off after a disastrous fire. Eucalyptus however seems to deliberately encourage canopy fire. Their bark peels off and falls off in great strips, leaving a pile of what amounts to kindling at the base of the tree, with some loose strips leading thoughtfully up into the canopy of oil-soaked leaves. They are a recipe for the smallest ground fire leading to an almost explosive canopy fire. After which they recover, remarkably quickly. 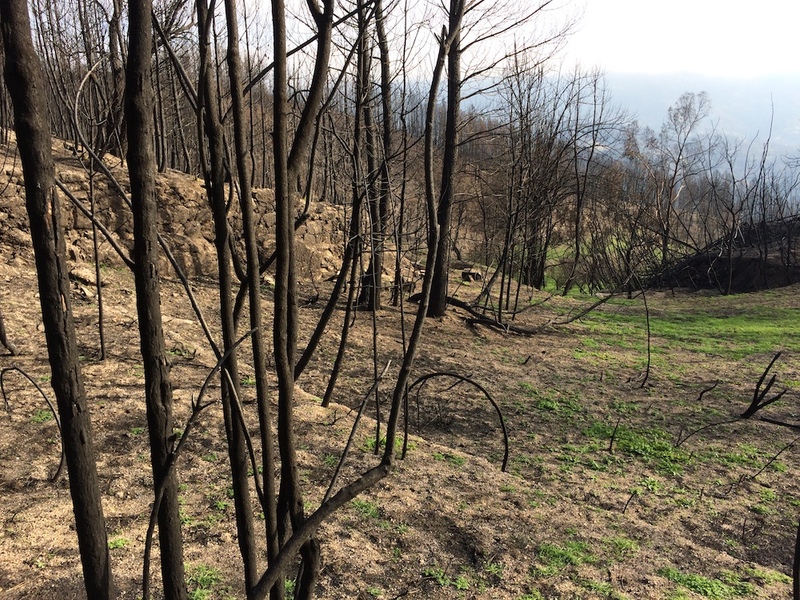 Sprouts can be seen surprisingly far up blackened trees only months after burning. In other words the trees' burning seems an evolutionary adaptation, that knocks back other tree species and gives the eucalyptus a competitive advantage. Just the same as with grasses, which burn easily, but survive and flourish amongst more seriously damaged woody plant seedlings. To add insult to injury, young eucalyptus seem almost unaffected by the fire - presumably the canopy fires sweep over the top of them. I wonder too if the silver foliage they have is somehow fire-proof. 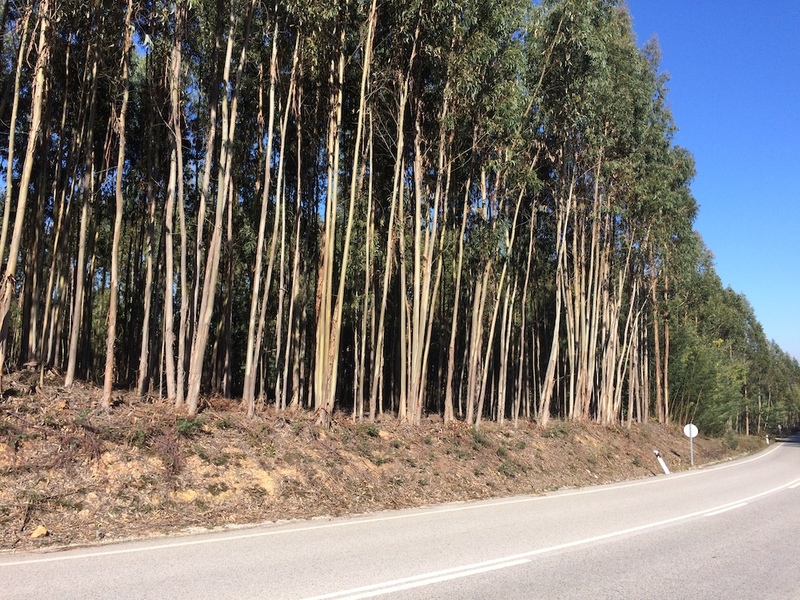 I wrote about the origins of the Portuguese eucalyptus problem in this posting. Only to add that I have since found out that Portugal was massively deforested in the 19th and early 20th century by a combination of overpopulation and traditional agriculture linked to a failure to industrialise. Zillions of sheep and goats roaming the hills eating tree seedlings apparently. That linking of population issues with unadaptive agriculture and failure to develop sounds like today's Haiti or Rwanda. That's another story. 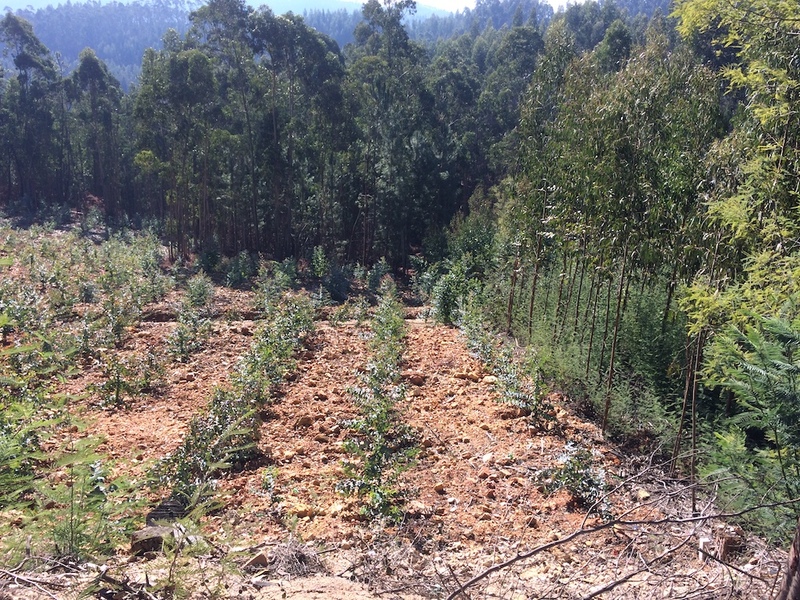 Find out more about the battle against Eucalyptus in Portugal here. The same horror stories around Eucalyptus, pine and also palm trees here. Why are palms often the first and only choice for trees? Re Portugal's devastating fires and Ophelia: I read John mcphee's "the control of nature" many years ago. The section about the Los Angeles basin, it's geology, fires, rains, and mudslides is so instructive and informative. Sad to say, the observations (about the inexplicable connections between the fire sites, the following torrential rains--heavier than in adjacent, unburnt areas--and ensuing mudslides) McPhee made seem to have been ignored in the succeeding years, as we are continually treated to sensational news coverage of the "unbelievable coincidences" of pacific storms, fires, mudslides, destruction of life and property. As McPhee noted, meteorologists had no explanation for these "coincidences," which were nonetheless measurable ad observable. It’s clear that fire benefits the trees. “For most eucalypts, fire was not a destroyer but a liberator,” writes fire ecologist Stephen Pyne in his book Burning Bush. Many species of eucalyptus both tolerate fire, hiding from the flames behind thick bark, and depend on it to open their seed pods. Fire often even seems to have a rejuvenating effect on the trees. After a fire, many eucalypt species will sprout epicormic shoots along their entire trunks. 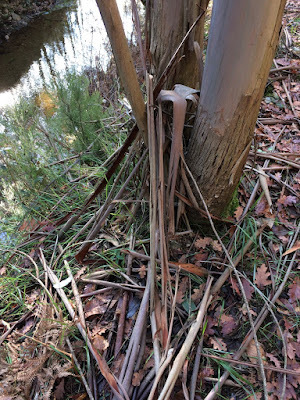 In the event that a fire does destroy the aboveground parts of the tree, it can send up new shoots from lignotubers, nutrient-filled organs hidden among its roots.